Guess How Much I Love You in the Summer Walker Books The adorable hares from the classic Guess How Much I Love You are back for summer in this gorgeous paperback! From the award-winning creators of Guess How Much I Love You comes this delightful summertime tale about colours - now in paperback! "Which blue do you like best?" asked Little Nutbrown Hare. It's summer and Little Nutbrown Hare learns about all of the different colours that are around him - the red of the berries, the green of the leaves, the blue of the sky… Seasonally themed and beautifully illustrated throughout, little ones will also have fun learning about colours while discovering what Big Nutbrown Hare's favourite one is! This is one of a four-part series featuring the seasons - collect them all! Аннотация к книге "Guess How Much I Love You in the Summer"
From the award-winning creators of Guess How Much I Love You comes this delightful summertime tale about colours - now in paperback! "Which blue do you like best?" asked Little Nutbrown Hare. It's summer and Little Nutbrown Hare learns about all of the different colours that are around him - the red of the berries, the green of the leaves, the blue of the sky… Seasonally themed and beautifully illustrated throughout, little ones will also have fun learning about colours while discovering what Big Nutbrown Hare's favourite one is! This is one of a four-part series featuring the seasons - collect them all! Издательство: Walker Books, 2015 г.
Мягкая обложка, хорошее качество печати, спокойное цветовое оформление. Принц Каспиан. Волшебная повесть из эпопеи "Хроники Нарнии" 5 рец. 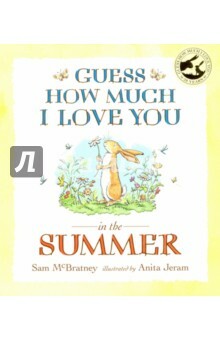 Если вы обнаружили ошибку в описании книги "Guess How Much I Love You in the Summer" (автор Sam McBratney), пишите об этом в сообщении об ошибке. Спасибо!